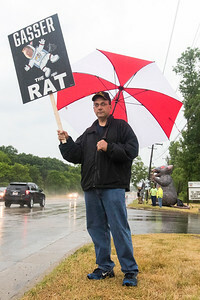 Sarah Nader - snader@shawmedia.com Dan Neumann of Cary protests in front of the Algonquin Road District building Wednesday, June 14, 2017 in Crystal Lake. 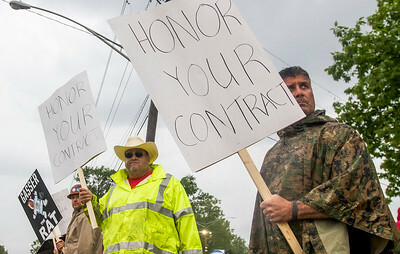 The International Union of Operating Engineers Local 150 protested the firing of three members shortly after Algonquin Township Highway Commissioner Andrew Gasser was sworn in. 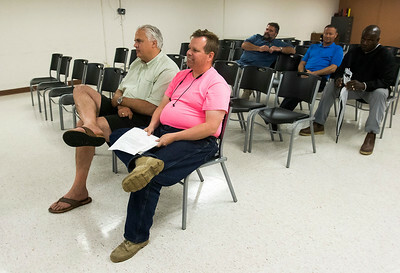 Sarah Nader - snader@shawmedia.com Algonquin Township Highway Commissioner Andrew Gasser (right) sits in an overfull room during Wednesday's monthly Algonquin Township Board meeting in Crystal Lake June 14, 2017. 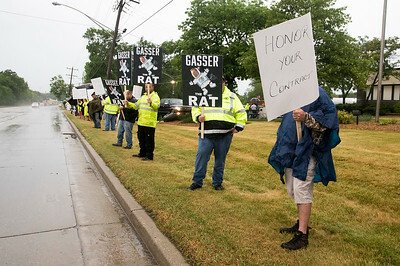 The International Union of Operating Engineers Local 150 protested outside the firing of three members shortly after Gasser was sworn in. Sarah Nader - snader@shawmedia.com Andrew Rosencrans (left) and Derick Lee speak during Wednesday's monthly Algonquin Township Board meeting in Crystal Lake June 14, 2017. Rosencrans and Lee were Both fired shortly after Algonquin Township Highway Commissioner Andrew Gasser took office. Sarah Nader - snader@shawmedia.com Protestors line Route 14 in front of the Algonquin Road District building Wednesday, June 14, 2017 in Crystal Lake. 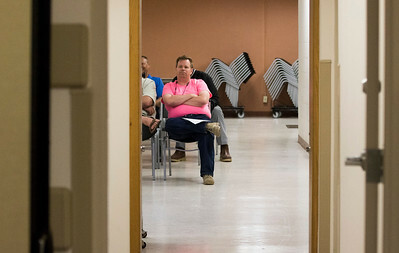 The International Union of Operating Engineers Local 150 protested the firing of three members shortly after Algonquin Township Highway Commissioner Andrew Gasser was sworn in. Sarah Nader - snader@shawmedia.com Bryan Haupt of Crystal Lake protests in front of the Algonquin Road District building Wednesday, June 14, 2017 in Crystal Lake. The International Union of Operating Engineers Local 150 protested the firing of three members shortly after Algonquin Township Highway Commissioner Andrew Gasser was sworn in. Sarah Nader - snader@shawmedia.com Andy Rucker (left) of Cary and William Mosier of Niles protest in front of the Algonquin Road District building Wednesday, June 14, 2017 in Crystal Lake. 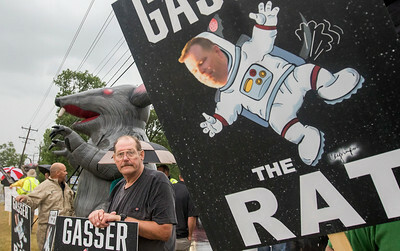 The International Union of Operating Engineers Local 150 protested the firing of three members shortly after Algonquin Township Highway Commissioner Andrew Gasser was sworn in. Andy Rucker (left) of Cary and William Mosier of Niles protest in front of the Algonquin Road District building Wednesday, June 14, 2017 in Crystal Lake. 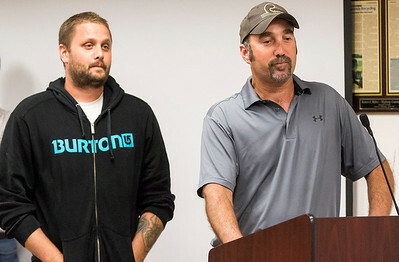 The International Union of Operating Engineers Local 150 protested the firing of three members shortly after Algonquin Township Highway Commissioner Andrew Gasser was sworn in.